Stellar Four: This Book Is A Steal! This Book Is A Steal! Usually I don't use my article day to just point you at an e-book sale, but this one is important enough to warrant a full article write up. Right now, one of the best fantasy books EVER is on sale for NINTY NINE CENTS. Do you have a Kindle? You're in luck! Got a Nook? Get this, you're included too! 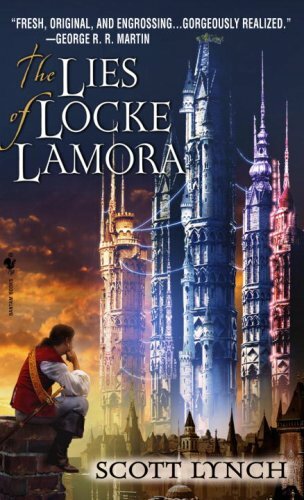 The Lies of Locke Lamora by Scott Lynch is ninety nine cents right now. For how long? WHO KNOWS. You better go download it RIGHT THIS SECOND. Do it before you even read why you need it. Just trust me. It's only a dollar, what do you have to lose? When have I ever steered you wrong? Okay, don't bring up Budapest. YOU AND I REMEMBER BUDAPEST VERY DIFFERENTLY. Okay, did you download it? Okay, good. Let's talk. We all know that I like my fantasy stories to be chocked full of thieves and assassins. I'm not much for epic, sprawling, multi-generational stories like George RR Martin's A Song of Ice and Fire series. I get desperately attached to characters. Locke Lamora is one character I am obsessively, insanely attached to. Lynch's Lies of Locke Lamora was released back in 2007 and has made an indelible mark on fantasy every since. Locke is a shrewd, charismatic thief. He's raised in a phony church, by a man who pretends to be a priest but really is a thief. Locke's family consists of other orphans who have shown considerable skill at deception and theft. They're taught not just how to pick pockets but how to craft believable personas and effect the mannerisms and accents of people from all over the world. Their hunting ground is a fantasy world that resembles Italy during the Renaissance (and Venice under the rule of the Medici in particular). It's one of the most interesting and fully realized fantasy worlds I've ever had the pleasure of reading about. The setting becomes another amazing character in the book and you're treated to interesting glimpses of every day life. The story is told in fragments. Every so often you're treated to a fascinating look back at Locke's life growing up and the training he received. Then the narrative shifts and you're following Locke around as an adult, dealing with elaborate thefts and finally taking revenge on some not so nice people. I know it's a cliché to say that a book or movie had you on the edge of your seat, but it's true in this case. I could not put this book down. Every moment I spent away from it was agony. It was an absolutely pitch perfect fantasy story. Compelling characters, insanely brilliant world... it should be required reading for fantasy fans. Lynch wrote an equally as amazing sequel called Red Seas Under Red Skies which is just as excellent as the first book. It ended on a cliffhanger of EPIC proportions. The third book was supposed to come out a few months later but the author suffered a series of personal tragedies and health issues that pushed the book back again and again and again. After a SIX YEAR WAIT the third book is finally coming out next month. Six years! I don't think a fantasy book has ever been so hotly anticipated since the last George RR Martin tome. The Republic of Thieves arrives on October 8th and I am so insanely excited for it that I am seriously considering calling in sick just so I can spend all day reading it. So that is why you need to buy The Lies of Locke Lamora for ninety nine cents while you can. You will not regret it. Trust me. I love, love this book. And I cannot wait for the third one to come out. The audiobook is $3.99! What is this sorcery? !